I have been silent for a few weeks on this blog (and from commenting on others blogs - sorry!) as I spend time with my family. We are loving being together again and England has put on the sunshine for us which has been wonderful. Last weekend I was able to give my parents the quilt I had made for them. They spent 25 years in India, so as soon as I saw the Madhuri fabric range by The Quilted Fish I knew this was for them! If you follow me on Instagram you will know that I had terrible trouble trying to quilt this one. It is the largest quilt I have made to date (72 inch square) and it just keep bunching as I quilted, despite numerous pins, rolling the quilt, using a walking foot etc. I think in the end the problem was that I didn't have enough space to rest the quilt on - I don't have an extension table on my machine and my dining room table is small! 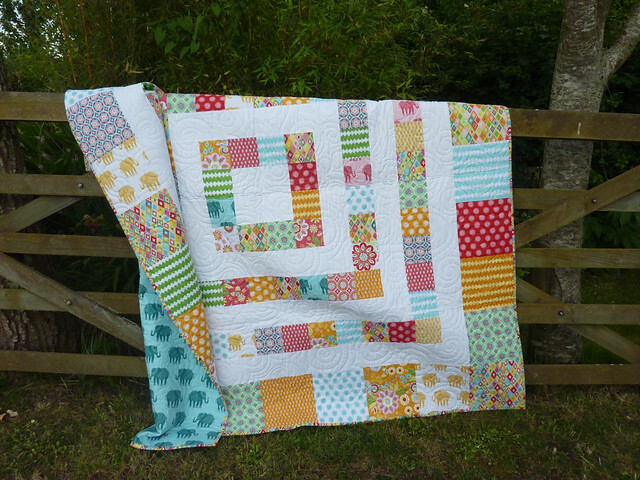 So I splashed out and sent the quilt to Trudi Wood for her to longarm quilt. To say I am pleased with how it turned out is an understatement! This is my final finish for the Q2 FAL 2014 and I am pleased to say that I managed to finish all my goals this quarter - yay!! (original post here). Thanks for reading, and I will be pack on July 16th with my post for the 2014 New Quilt Bloggers Blog Hop hosted by Beth! 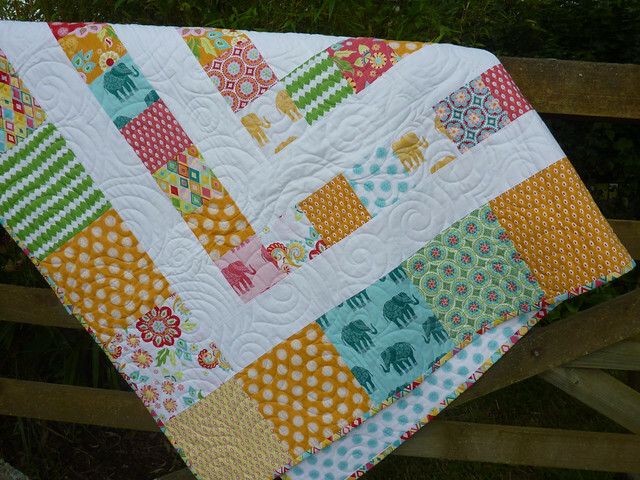 So happy to see your wonderful quilt finished. Your parents must be so happy with it! It's beautiful and I bet your parents love it!! Sometimes it's really worth sending out big quilts to a longarmer. It's great to hear you are having a wonderful holiday. It looks so lovely Deborah! No doubt they absolutely adore it - well done for persevering - looks great! Lovely to see you are back blogging. I think your parent's quilt is fantastic. I love the spicy ochres and reds in the fabric range. Is it available in the UK, do you know? Beautiful! And Yes it is so hard to quilt on the little dining room tables, lol. It turned out beautifully and I presume your parents love it. I had a quick look at your Instagram feed and sympathise - the joys and frustrations of quilting. Enjoy your time with family! Your quilt is beautiful! What an accomplishment finishing all of your goals! Impressive! I too love long-arm quilting help on the biggies. This is beautiful! I've had this quilt pulled up for several days and have been meaning to comment--it is just so beautiful! I love what you did with the fabrics from this line. They are very busy and colorful but the patchwork and white really organize it just gorgeously! I bet they loved this quilt! It's hard to believe you have so few quilts under your belt--your projects look like you've been quilting for years!! !